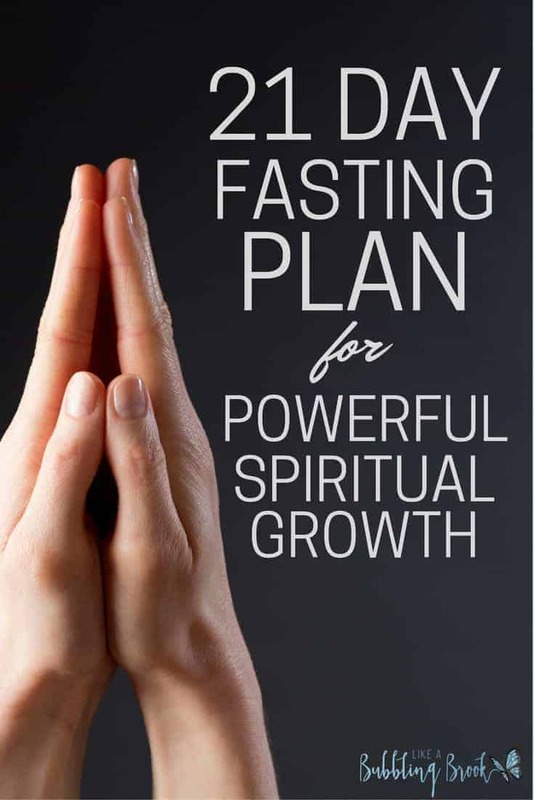 In this post, we talk about spiritual fasting plans and share our simple 21 day fast for spiritual growth. The month of January is paved with good intentions. We want to start the new year off right; after all, it’s a clean slate and a fresh start. We set goals and resolutions, make plans to purge the mess from our homes, reorganize rooms, attempt to make healthy food choices and exercise, and commit to grow deeper in our walk with the Lord. Many of us try a new Bible reading plan or resolve ourselves to more consistent prayer time. One thing we personally do is use the month of January as a focused time of prayer and fasting. Did you know fasting doesn’t have to be about ONLY abstaining from food for a set time period? One purpose of fasting is to deny our fleshly desires and, instead, increase the focus on growing our spiritual man. There are many ways we can do this. Here is a creative 21 day fast for you to try as you seek to hear from Him in a more powerful way! Refrain from personal (not work-related) use of media, such as social media, TV, movies, and radio. Instead, use that time to read your Bible, pray, contemplate on God, encourage someone else, etc. Shut out some of the outside noise and listen for Him. This is a fast (inspired by a passage in the Book of Daniel in the Old Testament) where you avoid “pleasant” and heavy foods. I’ve written several detailed posts about this fast. Start by reading this one. Use your prayerful discretion here; you may choose to fast from all food for a 24-hour period, fast from your favorite food for the week, fast from food from sun-up to sundown for five days, fast from sugars and other sweeteners, continue The Daniel Fast, continue the media fast, etc. This is entirely up to you! Do whatever you think will be meaningful to your spiritual life. Have you ever integrated a time of fasting into your spiritual life? Have you tried any other spiritual fasting plans? The benefits are not only spiritual growth, but increased focus on the things of God, greater awareness of His purpose for your life, and more peace in your heart. Often, you’ll find physical benefits as well, such as decreased anxiety and possible weight loss. Of course, this isn’t a reason for spiritual fasting, but it’s an extra, and often welcome, result of this 21 day fast. P.S. For more encouragement during your Daniel Fast, be sure to check out my printable Daniel Fast scripture cards. Love this inspiration..I’ve been thinking of starting a healthy raw food 2 week diet to get away from heavy foods..
so this inspires me and reminds me..I thought about it alot and then forgot! I would like to start a Daniel fast. However, I’m not very nutiously fit. As far as eating right to begin. I don’t weigh very much. I’m already weakling. I don’t have muscle in my body. I may weigh 110 pounds. I’m dehydrated mostly. Only bc I try to fast but I never do this right. How does one start when your body is already weak in muscle. I have one arm. And my left arm doesn’t have strength like when I was younger. My legs are weak too. They tire out. What’s the best way to fast when your not really fit. Carmen, thanks for asking! I’m sorry to hear about your health issues and would urge you to talk with your doctor before you try any kind of fasting with/without food. Maybe consider the media fast in the meantime? Blessings to you and I will keep you in prayer! I fast chocolate every year for the entire month of February. Anyone who knows me knows what a true sacrifice this is (I’m something of an addict)! Especially since February is Valentine’s month, so chocolate is literally *everywhere*. I’m praying for the salvation of my kids, their spouses, my grandchildren, and my parents and brothers, so I’ve committed to fast chocolate every February until they’re all saved.